NiGHTS Costume Available on Sonic Forces Bonus Edition! 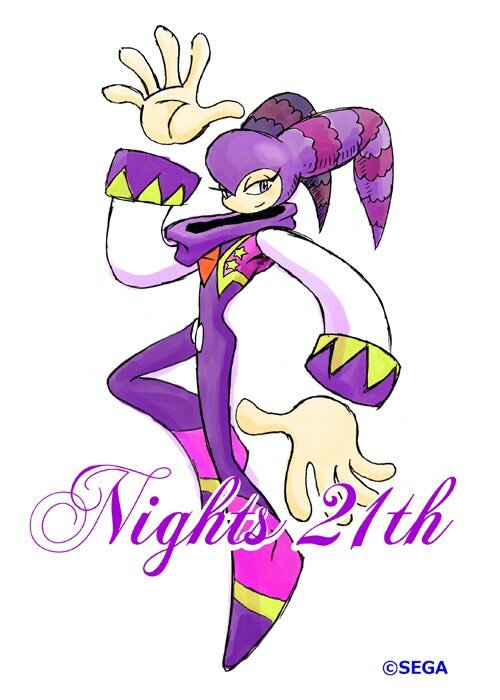 Happy 21st Anniversary NiGHTS into Dreams! How is it the 5th of July already!? That makes it 21 years to the day since NiGHTS into Dreams burst onto the gaming scene in Japan! It is also getting close to Journey of Dreams' 10th anniversary, how time flies! Over on Twitter we've been using the hashtag #NiGHTS21 to show all of your creations you've made to celebrate! Even Naoto Oshima himself got involved, creating this new lovely piece of NiGHTS artwork! Personally I've not had much time to create anything to celebrate, but I'm still hard at work at NiGHTS into Webcomics, which is wrapping up the main story soon. It's so inspiring to see all of the love people are still giving NiGHTS, and who knows, maybe we'll see NiGHTS appear again with SEGA Forever in the future! I'm not one for mobile gaming, but for NiGHTS I'd make an exception! This entry was posted on Wednesday, July 5th, 2017 at 9:49 pm	and is filed under News. You can follow any responses to this entry through the RSS 2.0 feed. You can skip to the end and leave a response. Pinging is currently not allowed.